Thom Shea is my guest today on the Steve Jobs inspired Join Up Dots free podcast interview. Thom is a man who has been on one of the most difficult journeys anyone can take. How to transition from a successful career in the US military to living a successful life as a civilian and top businessman. He served 23 years with distinguished Valor as a Navy SEAL, and during his military career he served in three wars. Ultimately leading a team of Navy SEALs into Afghanistan in 2009 where he earned a Silver Star, Bronze Star with Valor, Army Commendation with Valor and his second Combat Action Medal. 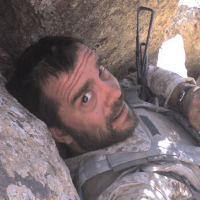 He was hand-selected to serve as Officer In Charge of the famed SEAL Sniper course from 2009 – 2011, and during his two year tenure, he transformed the sniper curriculum while successfully increasing both graduation numbers and shooting performance test scores. Now of course on Join Up Dots, we are all about the transition to business success. How do you find your thing when for many years you were doing what was expected and not what was truly inside of you. Well he is now the founder and CEO of Adamantine Alliance, a unique leadership and human performance coaching organization. He conducts training throughout the nation developing transformational performance results for various individuals, teams and organizations, using the skills that he had fine tuned over the past 23 years. Taking the seemingly disconnected dots of his previous life, to walk forward with confidence and passion into a new future? So when he was in the military did he start planning for what he was going to do in civilian life? And when did he realise that his past was actually holding all the answers to his future? Well let’s find out as we bring onto the show to start joining up dots with the one and only Mr. Thom Shea. What he considers to be the five key areas of life and how he manages to balance time between them all. Why he loves nothing more than moving into areas that are unwinnable, due to the lack of competition and the excitement he feels. Why social media is the only place that leaves him into a position of despair….so tries to keep out of it as much as possible. He hits with the perfect advice of “Don’t ever find a way out, find a way through the problem.”….how powerful is that?